Having landed the Triumph Hurdle at Prestbury Park, the Philip Hobbs-trained Defi Du Seuil made it seven wins from as many starts since joining the Minehead handler. Reunited with Barry Geraghty having been partnered by Richard Johnson at Cheltenham, the 4-11 favourite was forced to get serious for a period late on before finally asserting. Held up in mid-division early on, the JP McManus-owned four-year-old, together with Fred Winter runner-up Divin Bere, moved through to take command after the second-last. With little to choose between the pair over the final flight it was only halfway up the run-in that the odds-on favourite obliged, pulling clear for a length and a quarter success to complete a double achieved in years gone by through the likes of Zarkandar, Detroit City and Katchit. Geraghty said: "He's been brilliant all season but he was very good at Cheltenham. "He's a horse with a future, obviously, but to come back and do what he's done today and win again, I think that's seven wins, he's been busy. "He's very good and he can only improve with time, but it's very hard for a juvenile to hold that level of form all season - Philip has done a brilliant job with him." Hobbs said: "He's still unbeaten over hurdles and the bubble has not been burst yet! "We've had two other Triumph Hurdle winners (Made In Japan and Detroit City) but this one would be the best of them. "We need to talk to JP and everybody else to see what the plan will be for next season, but we've plenty of time to do that. "He's very adaptable and he's very tough, he just takes it all very well." Nicky Henderson was delighted with the run of 7/2 shot Divin Bere, who finished a creditable one and a quarter-length second behind 4/11 favourite Defi Du Seuil. Always prominent under Noel Fehily, the four-year-old son of Della Francesca battled on gamely after the final flight but was unable to hold off the challenge of the winner, who kept on well in the closing stages under Barry Geraghty. Dan Skelton's Bedrock (25/1) was a further four and a half-lengths back in third. Seven Barrows maestro Henderson said: "He just got caught on top-weight in the Fred Winter [finished second] at Cheltenham but you have to say he has been improving all the way through and he is a nice horse for the future. "He has been doing well and he is a horse to look forward to. 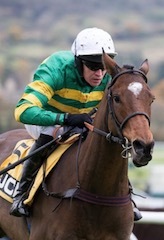 We gave Defi Du Seuil a race and that was great." As for the future, Henderson continued: "He won't race again this season. I don't know what we'll do but we're all very conscious of the fact that it can be difficult for those four-year-olds in their second season racing. "Divin Bere has been improving and if he can keep on improving, he will have half a chance next year, but life can be quite difficult actually if you look at it that way!" He added: "We're not complaining - he has had a good season." Bedrock, a convert from the Flat yard of William Haggas, cost connections 70,000gns at the Tattersalls Autumn Horses In Training sales last year and despite only coming fifth in a Grade Two at Kempton in February, the first run for his new yard, trainer Dan Skelton thought enough of his charge to step him up a level for his next outing, today's G1 Doom Bar Anniversary 4-y-o Juvenile Hurdle. Sent off a 25/1 chance Bedrock, came home third but didn't disappoint Skelton, who commented: "The horse is improving and has a good brain. I shall run him in a maiden hurdle in early May and then will consider the Flat for a spin." Harry Skelton, the trainer's brother and the Fastnet Rock gelding's rider, added: "The horse has run well. He was beaten by two very good horses and I am looking forward to next year."